Eight Cousins by Louisa May Alcott was published in 1885. It’s the story of Rose Campbell. Rose’s parents have both died, and she is living with her wealthy aunts in Boston. The aunts have seven sons, so Rose is the eighth cousin and only girl. She has been sick a great deal, and her only friend is the housemaid named Phebe. Students read a passage from the story and answer questions. 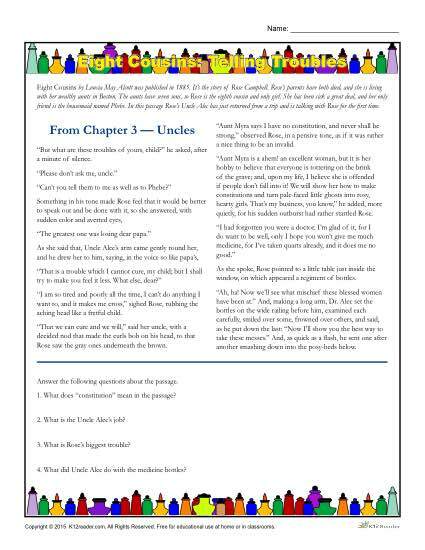 The activity is good practice for developing reading comprehension skills.